May 1, 1865 – President Andrew Johnson appointed “nine competent military officers” to form a commission and try suspects accused of conspiring to assassinate Abraham Lincoln. Those seeking retribution for Lincoln’s murder disregarded the questionable constitutionality of Johnson’s order. Federal authorities had apprehended and imprisoned seven men and one woman for allegedly taking part in the plot to kill the president: David Herold, George Atzerodt, Samuel Arnold, Lewis Paine, Michael O’Laughlin, Edward “Ned” Spangler, Dr. Samuel Mudd, and Mrs. Mary Surratt. All those accused were civilians, and under the Constitution they could not be tried by a military tribunal where civilian courts functioned, which was the case in the District of Columbia. But Johnson cited the opinion of Attorney General James Speed, who stated that the alleged conspirators may have violated the rules of war if they had worked with the Confederate government to assassinate the U.S. commander-in-chief during wartime. If the defendants had acted as “public enemies,” they “ought to be tried before a military tribunal” rather than in a civilian court. Many, including Lincoln’s former Attorney General Edward Bates objected to a military trial. Bates said, “If the offenders are done to death by that tribunal, however truly guilty, they will pass for martyrs for half the world.” But the intense outrage and grief surrounding Lincoln’s death muted those who criticized Johnson’s decision as unconstitutionally depriving the defendants of their right to face a jury of their peers. Rules governing military tribunals often called for less stringent evidence and more severe punishment than in civil courts. Moreover, while civil courts required a unanimous decision to convict, military tribunals needed only a two-thirds majority among the nine commissioners. Secretary of War Edwin M. Stanton carried out Johnson’s order by naming acting Adjutant General Edward D. Townsend to select the commission members. On May 6, Townsend selected all Republicans, with Major General David Hunter named commission president. Judge advocate was Stanton’s friend Brigadier General Joseph Holt, who had previously prosecuted civilians suspected of “disloyalty” and had been widely accused of despotism. 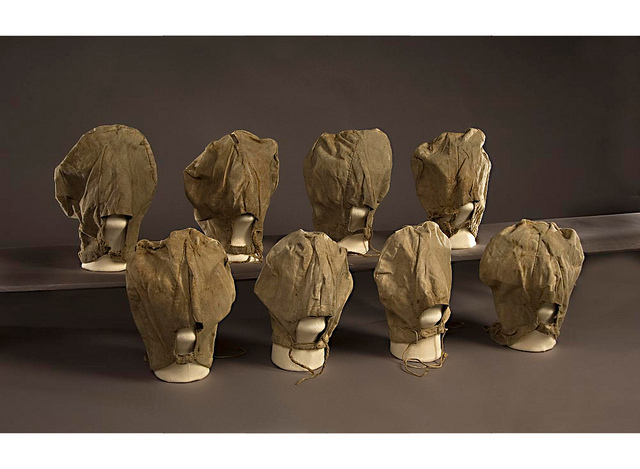 Guards placed thick canvas hoods lined with cotton on the prisoners, who could not see or hear anything around them. Only two small slits in the hoods allowed them to breathe and eat. The prisoners also remained shackled throughout their incarceration. The military commission first convened on May 8 in a newly created courtroom on the third floor of the Old Penitentiary in Washington. The tribunal consisted of Generals David Hunter (first officer), August Kautz, Albion Howe, James Ekin, David Clendenin, Lewis Wallace, Robert Foster, T.M. Harris, and Colonel C.H. Tomkins. Judge Advocate Joseph Holt served as both chief prosecutor and legal advisor to the commission. Radical Republican John A. Bingham and H.L. Burnett also served on the prosecution team. The next day, the prisoners pleaded “not guilty.” The trial began shortly afterward.